How do I isolate x (or P or T...) in a formula? A professor speaking "Math", which can seem like another language! photo by Jennifer M. Wenner. Sometimes, it may seem like your geoscience instructor is speaking another language when he/she talks about equations or formulae. Especially if he/she expects you to "manipulate" or rearrange them! But, equations can provide powerful tools for describing the natural world. In the geosciences, we can describe the behavior of many natural phenomena by writing an equation for a line (y = mx + b), or with exponential functions (y = ext). And with a little algebra, we can rearrange those equations to solve for ANY of the variables in them. Although this may seem like magic, you don't have to be a "mathemagician" to do this. 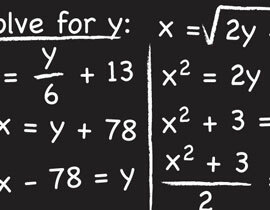 This page is designed to give you some tools to call upon to help you to learn some simple steps to help you to solve an equation for any of the variables (letters that represent the element or quantity of interest). Why should I manipulate equations? Photo of Ken Andrews (scientist at JPL) juggling. Modified by Jen Wenner. Equations are easier to handle before inserting numbers! And, if you can isolate a variable on one side of the equation, it is applicable to every similar problem that asks you to solve for that variable! If you know how to manipulate equations, you only have to remember one equation that has all the variables of question in it - you can manipulate it to solve for any other variable! This means less memorization! Manipulating equations can help you keep track of (or figure out) units on a number. Because units are defined by the equations, if you manipulate, plug in numbers and cancel units, you'll end up with exactly the right units (for a given variable)! To be honest, equation manipulation occurs in almost every aspect of the geosciences. Any time you see a P or T or ρ or x (or even =), there is an equation that you could manipulate. Because equations can be used to describe lots of important natural phenomena, being able to manipulate them gives you a powerful tool for understanding the world around you! See the Practice Manipulating Equations page for just a few examples. Solving for y by Jennifer M. Wenner. RULE #1: you can add, subtract, multiply and divide by anything, as long as you do the same thing to both sides of the equals sign. In an equation, the equals sign acts like the fulcrum of a balance: if you add 5 of something to one side of the balance, you have to add the same amount to the other side to keep the balance steady. The same thing goes for an equation - doing the same operation to both sides keeps the meaning of the equation from changing. If we wish to solve for b in this equation, we must subtract mx from both sides. This equation can also be written b = y - mx, if you prefer to have the solved variable on the left. RULE #2: to move or cancel a quantity or variable on one side of the equation, perform the "opposite" operation with it on both sides of the equation. For example if you had g-1=w and wanted to isolate g, add 1 to both sides (g-1+1 = w+1). Simplify (because (-1+1)=0) and end up with g = w+1. Let's imagine that we're studying an iceberg and we want to know what the density of that iceberg is. How do we rearrange the equation to solve for this variable? It is going to take multiple steps to isolate the ρobject on one side of the equation. How do we begin? and, 1 minus 1 equals 0 so we can get rid of the 1's on the left side. With a little rearranging of the right side of the equation, we end up with an equation to solve for the density of the iceberg! Here are some simple steps for manipulating equations. Under each step you will find an example of how to do this with an example that uses the geologic context of density (a measure of mass per unit volume). Assess what you have (which of the variables do you have values for?, what units are present?, etc.). DO NOT plug in any numbers yet! 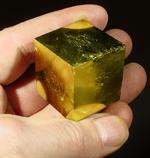 For example: You have a cube of pyrite that is 3 cm x 3 cm x 3 cm. You know that pyrite's density is 5.02 g/cm3. 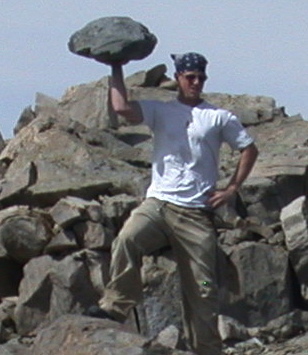 Can you figure out how much that cube of pyrite weighs (without using a balance)? Which of these values do you have in the question above? You have density (5.02 g/cm3). And with the information you can figure out volume (length x width x height). The question above asks you to determine the mass of a pyrite cube (without weighing it/using the information given in the problem). So, in the equation for density, you want to determine "mass". Remember, don't plug anything in yet. Rearrange the equation so that the unknown variable is by itself on one side of the equals sign (=) and all the other variables are on the other side. RULE #1: you can add, subtract, multiply and divide by anything, as long as you do the same thing to both sides of the equals sign. and rearrange it. We want to isolate the variable for mass (m). To do this we first multiply both sides of the equation by volume (v). Then, we can cancel volume on the right side of the equation (volume ÷ volume = 1). We end up with an equation that has mass isolated on one side of the equation! NOW plug in the numbers! Replace known variables with their values and don't forget to keep track of units! Determine the value of the unknown variable by performing the mathematical functions. That is, add, subtract, multiply and divide according to the equation you wrote for step 2. Ask yourself whether the answer is reasonable in the context of what you know about the geosciences and how much things should weigh. This is a thing that mostly takes experience. If you are unsure, you could find a balance and weigh the cube to see if you're in the right ballpark. If you're holding it in your hand, you could guess whether this seems about right...More importantly, if you get a number like 135,000 g, do you think that's reasonable? That's 135 kg (which is about 300 lbs!) and it is probably not right. What about if you get something like 0.00135 grams? It is important to be able to distinguish whether you're in the right range, more than whether you're exactly right. Another way to think about whether you're right is to find something that weighs the same from your own experience. What does 135 g feel like? Well, there are about 450 g in a pound, so 135 g is between 1/4 lb and 1/3 lb. What do you know that has a similar weight? (The first think that comes to mind for me is burgers...). Does it make sense that a cube of pyrite (a golden metallic mineral) that is about one inch on each side would weigh that much? Use your own experience to develop a way to evaluate weights and other measures. I still need more help! (See the links below for more help with equations). 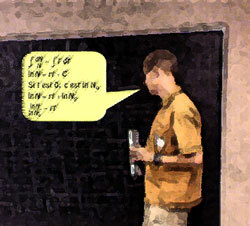 The chemistry department at Texas A&M has a math review page about Algebraic Manipulation. The Economics and Business faculty at University of Sidney has a page where you can practice your equation manipulation skills! Take the algebraic manipulation quizzes!